it’s your last day to get in on the pattern give-away! enter here. sorry for the blur, but he’s a moving :) in the first pair of longies that fit him. they kind of fit him before, but they really fit him now that his legs have gotten a little longer, or stretched out. raveled here. 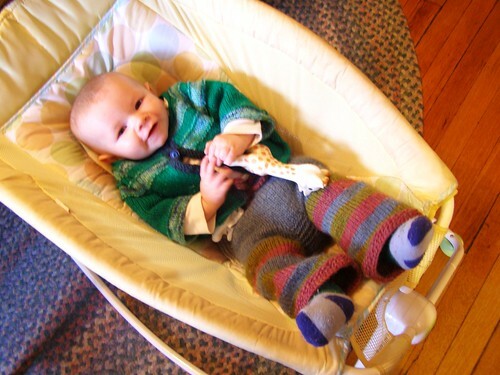 This entry was posted in baby, knitting, longies, soaker by cosymakes. Bookmark the permalink. Love the baby woolly pix, can never get enough of those! And the falling snow on your header. How do you do that? Super cute! Now that’s one happy looking kid, all wrapped up in handknits.